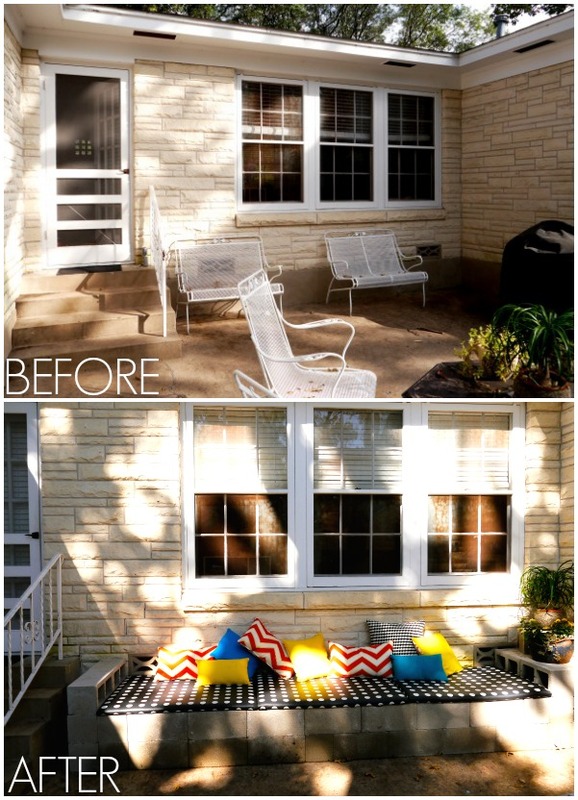 Evolution of the Backyard Patio - C.R.A.F.T. 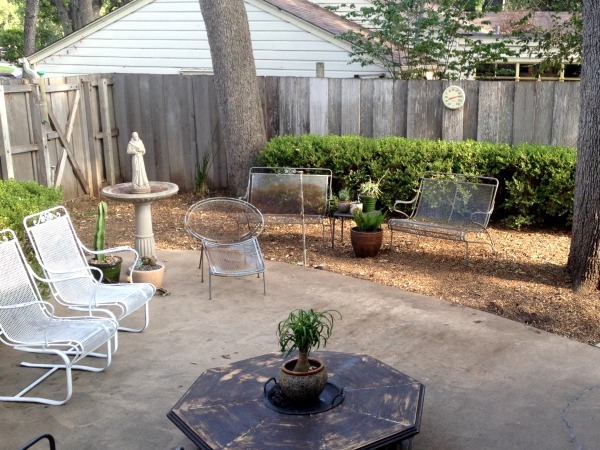 We moved into our current house in 2013 and the backyard patio was a cement slab surrounded by 2 giant rows of bushes. 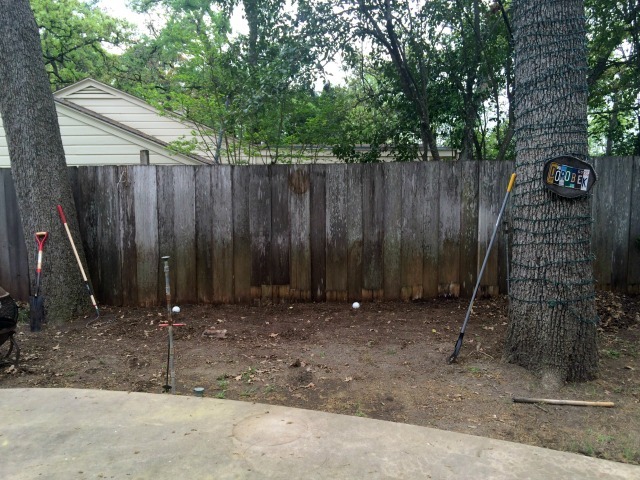 Over time, we’ve done lots of small DIY improvements to our yard. Six years later, we feel like we fully understand how we use the space and our ready to give it a major makeover. I’m pretty good at making shelves look cute, but making a site plan for our entire backyard was way over my head. We needed back up. 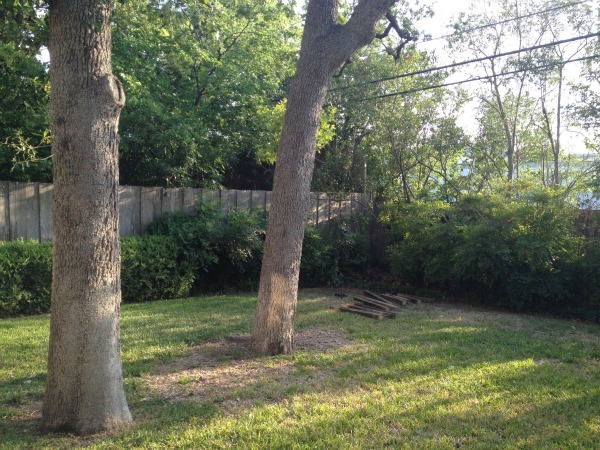 We decided to hire a landscape architect to help us create the best backyard for us! I also teamed up with Home Depot to give our backyard its final makeover. I want to share how our backyard has evolved over the last 6 years. 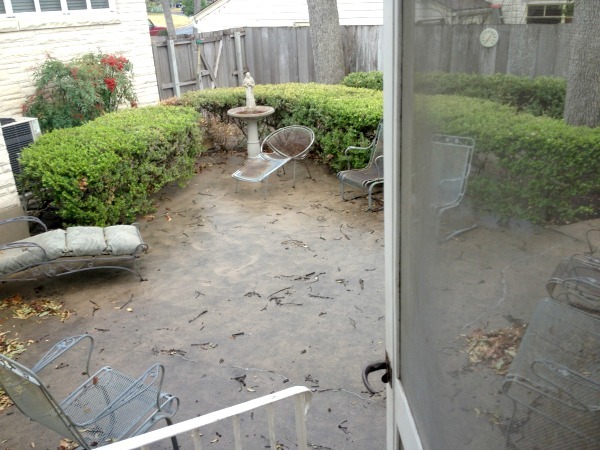 This is what our back patio looked like the day we moved in. 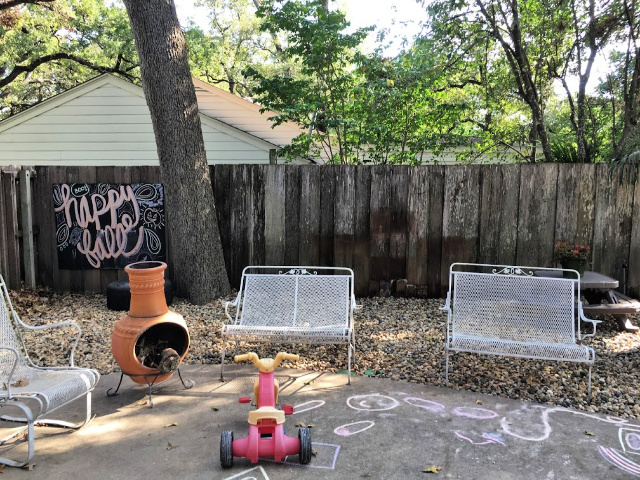 Three months after we moved in, Andy ripped out the giant row of bushes bordering our patio and I gave the patio furniture a bazillion coats of spray paint. We loved the extra space the bushes created so much that we decided to get rid of the bushes against our back fence too. 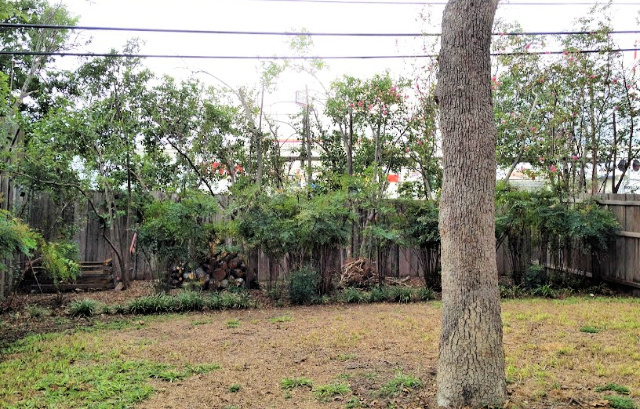 We love the look of our old, grey, wide cedar planked fence! 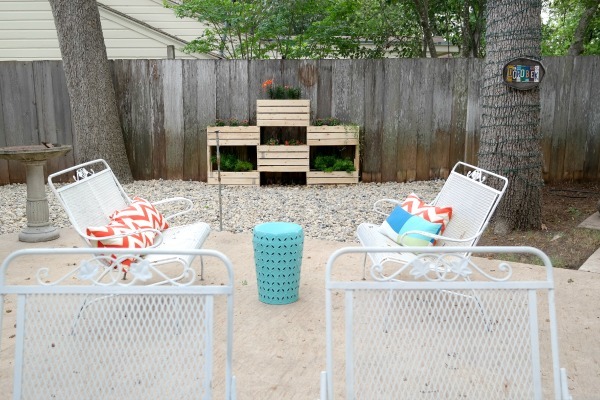 Another backyard project we did before Maxwell was born was a DIY cinder block bench. We took this apart about 18 months later when I realized how valuable the cement slab was for playing. We didn’t use the bench enough to justify it taking up so much space on our small patio. It was cute while it lasted! In 2015, I worked with Home Depot on a series of DIY projects. One of them involved creating this awesome DIY vertical planter. The planter created a fun focal point, and we decided to add rocks to extend the patio. We tried growing our own grass in this area, but it didn’t work out. 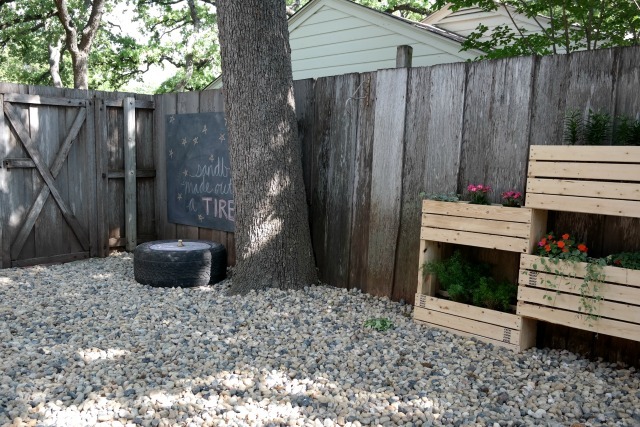 Maxwell was about 6 months old at this point, and we built this cute DIY tire sandbox. We also turned this SXSW project into our backyard chalkboard. 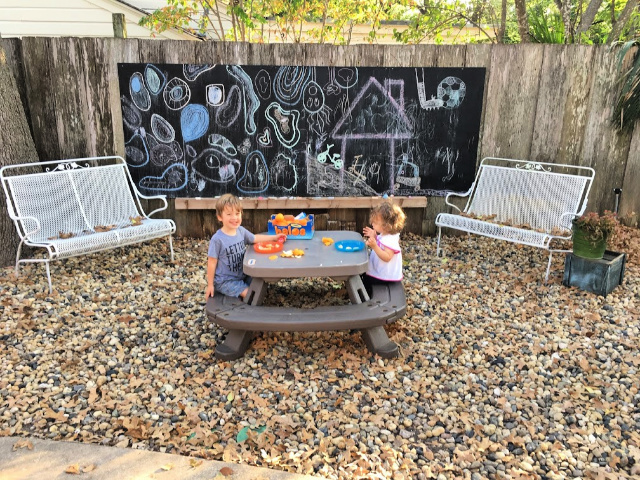 This project made me realize how much I enjoy a backyard chalkboard! We had another baby, and the tiny sandbox wasn’t cutting it anymore. The vertical planter was struggling. Keeping plants alive is hard enough, but we didn’t use treated lumber to build the vertical planter the first time around. So, the planter was rotting and the plants were not living their best life. We decided to cut our losses and create a giant chalkboard in place of the vertical planter. No maintenance and more creative space. Sold! We ripped down the planter, and doubled the size of the chalkboard! The kids were old enough to ride tricycles and were fully utilizing the cement slab at this point. I decided to move the patio furniture to the rocks and give them more room to ride. They loved this! Up until now, I’ve only mentioned the cement patio side of our backyard. We also have a large grassy/ dirt area. The two sides are currently divided by an awkwardly placed stone planter. Pre kids, the planter was my salsa garden. Once the kiddos got a hold of it, it turned into a dirt sensory bin of sorts, ha! 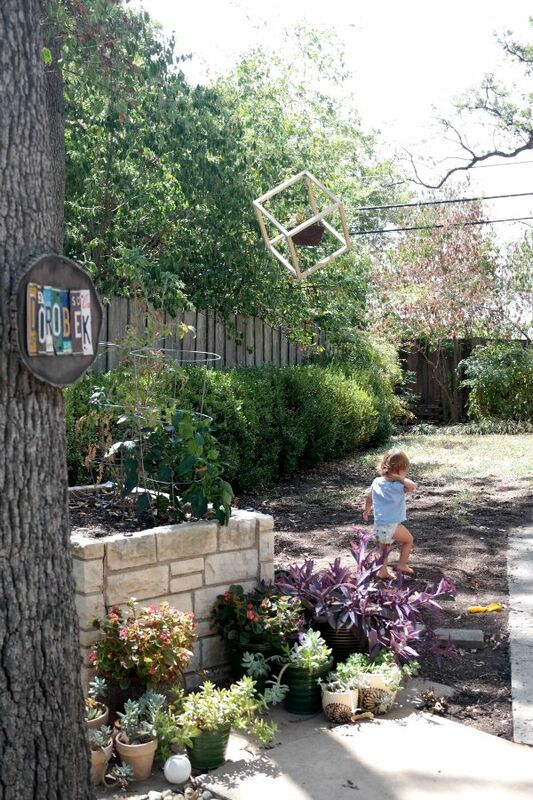 That DIY hanging cube planter was another Home Depot project Andy made for C.R.A.F.T. Sadly, it got destroyed when the limb it was hanging on fell on our roof in a storm. 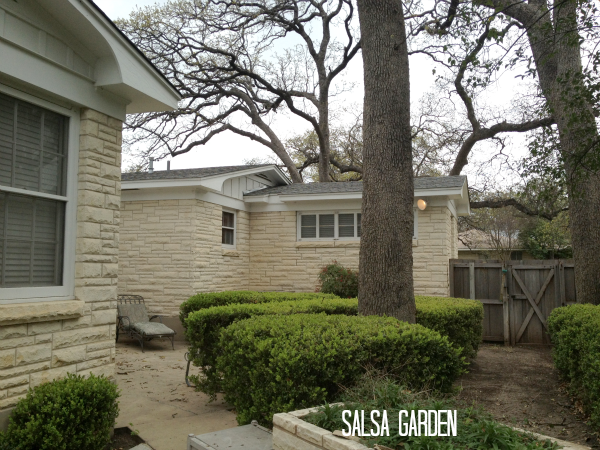 Here’s a fun angle looking from the opposite side of the salsa garden into our once very bushy patio! Here’s the current view of the same picture above. A lot less bush, and a lot more plastic vehicles! Moving to the other side of the planter box, we have a large what should be grass area. In reality, it’s a nice mixture of dirt, grass, weeds and dead grass. Another one of our early backyard projects was building a compost bin from recycled fence posts. It lived in the back left corner of what we call the jungle. We used the compost bin until the city of Austin made the move to provide free compost pick up every Friday. We took that compost bin out about a year ago and utilize this free service from our city! Speaking of the jungle, it was covered in poison ivy. Andy and I quickly learned we are both very allergic to poison ivy and had paid someone to rip it all out for us and clean out the jungle to allow more play space for the kids. The picture below shows the jungle in its best state over the last 6 years. You can also see the status of our grass. You can see the DIY compost bin in the left hand corner. After using our backyard for 6 years with 2 little kids, we had a pretty good idea of what we wanted, but weren’t 100% sure how to implement. 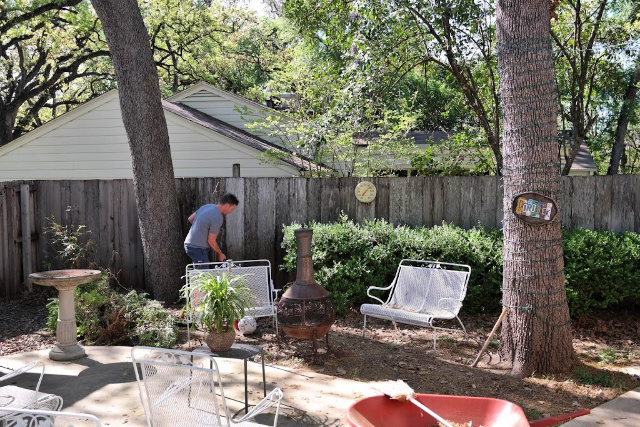 We enlisted the help of a landscape architect to help devise a plan for the backyard. If you’re in Austin, Micah at Craft Outdoor was incredible! He was a great listener and gave us a design that perfectly fit our needs. He even helped save us money and incorporate things we already had in our yard. The kids love and use the cement slab patio every single day. I like the shape and want to keep that as part of our backyard. We have a hard time keeping plants and grass alive, so the less maintenance the better. We have an insane amount of leaves fall from the trees in the fall and wanted to take this into consideration. We have a huge tree that shades our entire house and almost touches the house in the back corner. We want to minimize the amount of stress to this tree. We want a legitimate space for a play structure for the kids that doesn’t need to be mowed around. I want space for a trampoline! In a perfect world, it would be an in ground trampoline. We’d love to have seating near the play area. We want to keep some amount of grass for the kids to play. 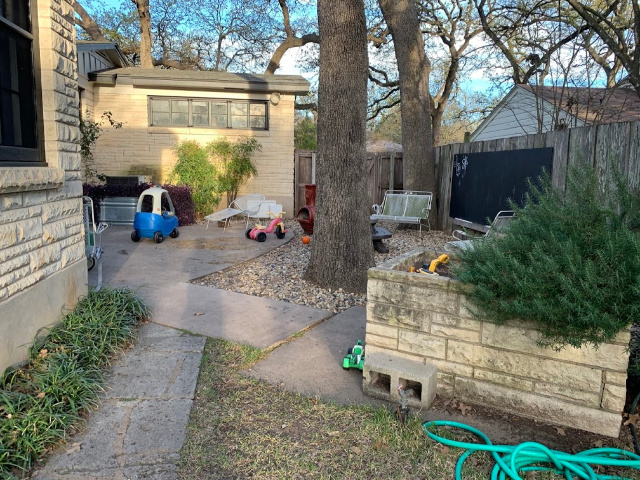 We want to reclaim some of the side yard and include it in our backyard. Remove the planter that divides the 2 sides our yard. Build something to hide our AC unit. Here’s the site plan complete with everything from our list above! I put the red “X” on our cement slab patio to give you a reference point. 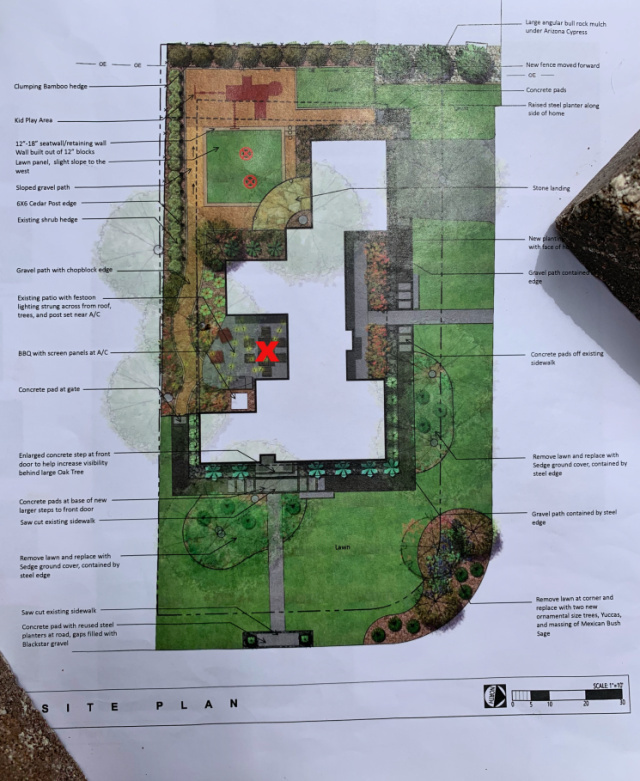 I love this front yard plan too, but that is going to be a project for another day. This project is underway and I couldn’t be more excited! We are calling the paved path around the grassy area the racetrack and the kids can not wait! 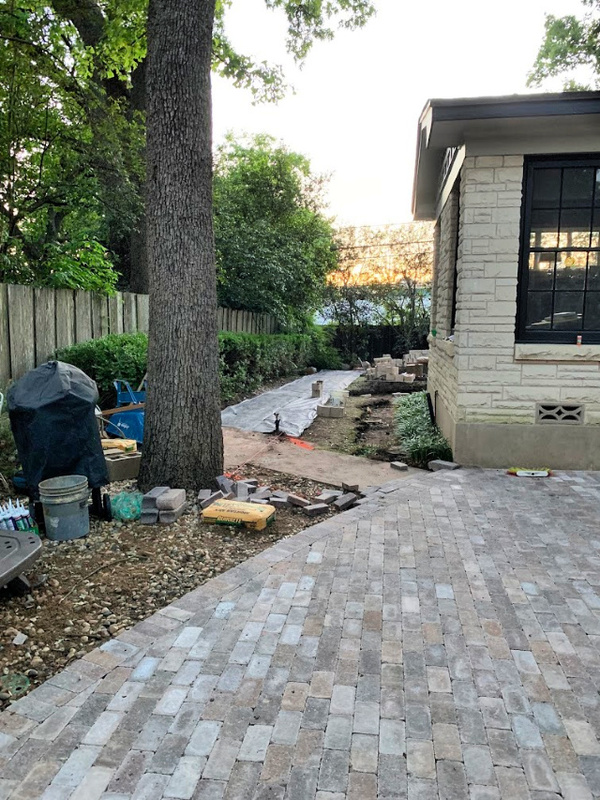 We ended up choosing Rumblestone mini sierra blend by Pavestone and I seriously love how it’s turning out! Here’s a little sneak peek of the backyard patio. It’s coming along and I can’t wait to show y’all the after! Who am I kidding, I can’t wait to see the after!